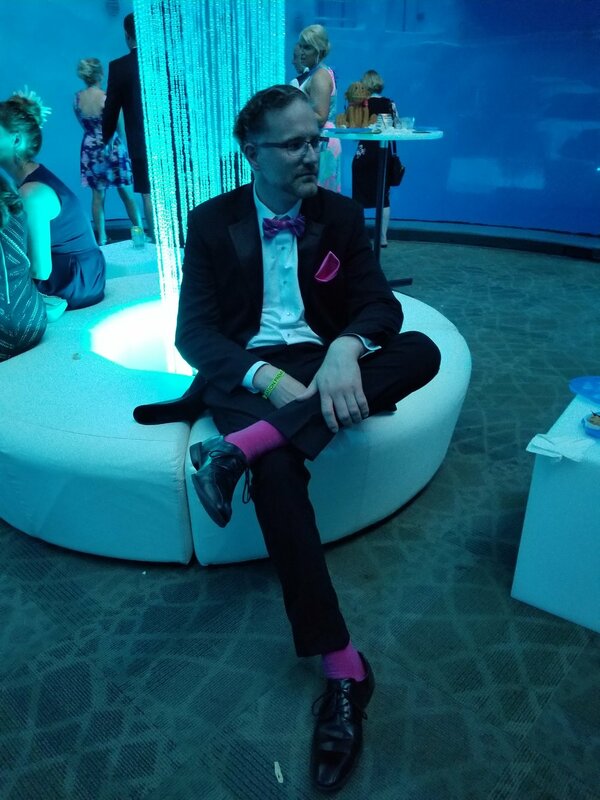 Saturday I had the pleasure of attending Zoobilation; the Indianapolis Zoo's biggest fundraiser, and arguably the city's biggest party of the year. I wasn't sure what to expect; many said to come hungry, wear flats and drink plenty of water to combat the heat at Zoobilation....all of which I learned were important. This was the hottest Zoobilation in Indianapolis on record. Still as a first time attendee, I was still pretty clueless to the magnitude of this spectacle...especially when it came to fashion. As this year's Fashion Correspondent for Zoobilation, I studied past fashion moments to get an idea of what I had gotten myself into. Feathers, sequins and tulle made their appearances over the years in Zoobilation dresses and tuxes, so I knew creativity was allowed and I needed to come and slay. When we arrived at the event there was a sparkly blue carpet that was in need of a good step and repeat. Right away I was called over to Fox59 to chat about my look! Not a bad way to start the event! The fashion conversation at Zoobilation was underway! The theme this year was "Swing into Fashion", honoring the zoo's newest exhibit featuring the ever playful swinging monkeys called long-tailed macaques. I just knew we would see several people come out in monkey inspired fashion. Several guys came out in themed jackets featuring work by local artists. The ladies dawned bright tones and mostly long gowns. This is a formal event, so long gowns are necessary to really be dressed appropriately. I have to say, most didn't disappoint. I knew early on I wanted to rock full color in my Zoobilation dress. I opted for a truly Summer/Tropical look featuring accessories to die for. I called the look Island Dream....how'd I do? Oh, and that headpiece I'm wearing was made by yours truly! S/O to Micheal's for having the best products to bring my vision to life! I had a blast getting ready for this event! Turns out other people did too! Check out some of my favorite fashion moments from #IndyZoob below! See you next year, Zoobilation! Blogger Sierra Holmes (@eclectickurves) and husband. Print mixing at it’s finest! Shorts were a common trend due to heat at Zoobilation. Fresh floral custom headpiece for Zoobilation worn by @redshoediaries. Former Street Team member @redshoediaries poses with Sierra of @eclectickurves. Birds of Paradise floral headpiece worn by Nikki of the Smiley Morning Show. Fun prints reigned supreme throughout the event! Enjoying the Mangrove Lounge; the exclusive party for VIP attendees in the dolphin exhibit. Red was a popular color this year! News reporter Tanae Howard @tanae.howard wearing re-purposed gown by Nikki Blaine Couture. Nikki Blaine channeling Madame Butterfly. Our mascot for the night…Kate’s (@intoindy) Kate Spade monkey bag! For those of you asking, I have linked my entire look here! Well, almost- the necklace is from Charming Charlie, but I can't link it, so I found another cute option! Happy Shopping! Enjoy today! Click the links to shop! ** A small profit may come back to the blog when affiliate links are clicked. Thank you for keeping the blog going!